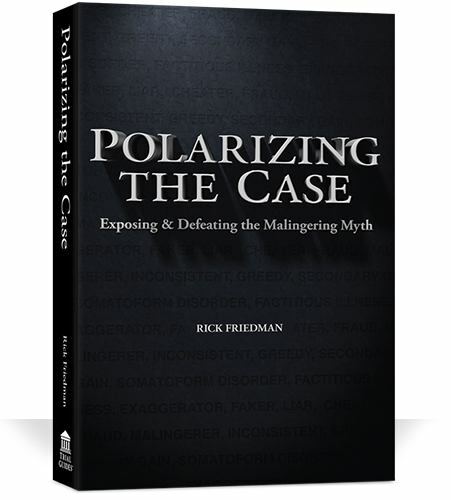 In his second book, Polarizing the Case, Rick Friedman teaches trial lawyers not to fear allegations or insinuations that their client is malingering or exaggerating injuries. Instead he provides, in his own words, “a guidebook for wrapping the malingering defense around the neck of the defense lawyer and strangling him with it.” Click to purchase. I began practicing law in 1979, it was rare for defense lawyers to accuse a plaintiff of malingering. Maybe they knew jurors would not be receptive to such arguments, absent definitive proof. Perhaps jurors have always been receptive, but defense lawyers back then felt constrained by their role as officers of the court, or by basic human decency. Whatever the reason, they usually refrained from attacking people as liars and cheats when they knew it wasn’t true. I enjoy speculating about such things but don’t pretend to know what accounts for the change. What I do know is that the malingering defense seems to crop up everywhere now. In personal injury cases, large and small, in medical malpractice, even contract cases, the defense will frequently find a way to imply, insinuate, or outright accuse the plaintiff of being a liar, a cheat, and a fraud. Most plaintiff lawyers have had the unfortunate experience of watching a strong case defeated by preposterous allegations of malingering. We may chalk up the verdict to a random bad jury or a biased judge. But then it happens again. And again. Not just to us, but to our professional friends and associates. These tactics can be seen most clearly in what the insurance industry has labeled “Minor Impact Soft-Tissue” (MIST) cases. About fifteen years back, the industry made a decision to plug into public suspicions about plaintiffs and aggressively litigate these cases. The result has been to create the conventional wisdom in the plaintiff ’s bar that these low impact cases cannot be won. Of course, these tactics are not limited to MIST cases; they crop up everywhere, and it is often difficult to know how to deal with them. This book has a modest goal: to quickly and efficiently provide a blueprint for defeating the malingering defense. Actually, it is a guidebook for wrapping the malingering defense around the neck of the defense lawyer and strangling him with it. Part I progresses through the various stages of preparing and trying a case, showing how to polarize and defeat the malingering defense. I make no effort to comprehensively cover each stage. I am simplistic for the sake of clarity. Each chapter tries to explain what must be accomplished at that stage to defeat the malingering defense at trial. The chapter on written discovery, for example, makes no attempt to outline all written discovery you should propound in a particular case. Part II shows polarizing principles in action. This part uses real trial transcripts to show the polarizing process from start to finish. The insurance industry has done a spectacular job of convincing the public—our jury pool—that people who make injury claims are not hurt and are exaggerating for monetary gain. It’s not generally true, but it is powerful because it can be true—even if infrequently. This book is not for cheaters. None of us want to help anyone get away with what amounts to larceny. This book is designed to help you protect the innocent victims of this widespread character-assassination. The morally bankrupt strategy of accusing honest victims of being liars, cheats, and frauds has dominated American courtrooms for too long. I hope this book will help you get your clients the justice they deserve.